Universal, widescreen 1.85:1/16x9, languages: English DD 5.1 [CC], French Dolby Surround, subtitles: none, single side-dual layer, 18 chapters, rated PG-13, 122 min., $24.98, street date 1/11/2000. Directed by Kinka Usher. Starring Ben Stiller, William H. Macy, Hank Azaria, Kel Mitchell, Paul Reubens, Janeane Garofalo. When Captain Amazing, Champion City's legendary superhero, falls into the hands of the evil madman Casanova Frankenstein and his disco-dancing henchmen, there's suddenly a chance for the aspiring superheros to show what they can do. They're the Mystery Men… a ragtag team of superhero wannabes featuring: Mr. Furious, whose power comes from his boundless rage; The Shoveler, a father who shovels "better than anyone"; The Blue Raja, a fork-flinging mama's boy; The Bowler, who fights crime with the help of her father's skull; The Spleen, whose power is pure flatulence; Invisible Boy, who's only invisible when no one's watching and the Sphinx, a cliché-spewing philosopher. I am actually a fan of superhero movies. I'll admit that right out. I never could get into the comic books but those movies were pure fantasy and great entertainment. Well, some anyways. Superman was a film I saw very young and it completely captivated me. It's there that this fascination with the superhero genre began (and let me tell you how heart broken I was when I was informed that the guy playing Superman was not actually flying - ah, to be an innocent little rip again). Since then, except for it's first sequel, all the other Superman films and other superhero films didn't ever come close to matching up to that one. In 1989 Batman was the next film to completely absorb me into it (of the superhero genre) and a love for these movies grew again. It was followed by a fairly good sequel and a couple okay rip-offs, then after the rather annoying Batman Forever they all began to fall down that hole again. And then the final blow in my gut: Spawn and Batman & Robin. Mystery Men I was a little iffy on. It looked interesting but after all the bomb superhero movies coming out lately, it would have been my luck this movie would be pretty bad as well. I did go see it and was glad to know I was wrong. Well, on the most part. Mystery Men is a very clever comedy, spoofing the superhero genre, but ultimately outlasts its welcome. Champion City is low on crime thanks to it's ultimate superhero Captain Amazing (Greg Kinnear who I could actually buy in a real superhero role after this). He goes around, fighting crime in his awesome body armor (covered in sponsored endorsements), protecting the peace and just being an all around good guy. Unfortunately, he has done such a good job there is no crime left. He is low on work and he has not had a good nemesis in a long time, making for boring battles. So now he is losing his sponsors (first off, Pepsi). He comes up with a scheme to get his most favourite bad guy to be released, so he can reek havoc and gain his popularity back. The villain is Casanova Frankenstein (Geoffrey Rush), a disco loving madman. Captain Amazing in his "Bruce Wayne" type persona influences the release of Frankenstein. He immediately goes committing crimes and Captain Amazing, while trying to stop him, is captured. This city seems to be crawling with superhero wannabes as well. We first meet Mr. Furious (Ben Stiller), The Shoveler (William H. Macy) and the Blue Raja (Hank Azaria). When they learn of the kidnapping of Captain Amazing they decide that this is their chance to get into the limelight. They then go out searching for other superheroes to join them. And along the way they meet some interesting ones at that. The first half of the movie is fresh, original and very funny. The superheroes are all a hoot. Stiller's Mr. Furious is one of the funniest ones. His super power consists of getting pissed off and that's about it. In his funniest moment he builds up all his rage and then tries very hard at ripping the Corvette emblem off of a (what else) Corvette. Blue Raja has nothing in common with his name (he throws utensils, wears green as a primary colour and speaks with an English accent). Invisible Boy (Kel Mitchell) turns invisible as long as no one looks at him (including himself). The Bowler (Janeane Garofalo) carries around a bowling ball with the skull of her dead father encased within (and she carries on conversations with it). And the least amusing (but has his moments) character is the Spleen (Paul Reubens), who has a very bad case of flatulence. And don't forget the Sphinx (Wes Studi) whose words of wisdom will give anyone a headache if they listen too closely. The movie can also be quite creative in other areas. Its villains are disco dancing pimps, including Casanova. Eddie Izzard plays one of Casanova's henchmen, with the platform shoes, chains, bad hair and damn ugly pants. Casanova is all super villain with his wild scheme that doesn't make much sense and a bunch of cool gadgets (and it doesn't hurt that Rush is obviously having a ball with the character). There are a lot of funny lines and situations like a talk between Shoveler and Mr. Furious over the identity of Captain Amazing ("He wears glasses. Captain Amazing doesn't wear glasses."). This is all set up in the first half of the film. After the one hour and fifteen minute point, the movie goes into climax mode and I'm ready for another 15 minutes. Unfortunately the movie has another 45 minutes, and this is it's biggest flaw. It's just too long. The first half is delightful and very amusing and the last half just goes on and on with very little to laugh at (except for a very amusing and surprising rescue that goes horribly wrong). Once in a while there are some good lines thrown in around here (obviously all improv) but nothing really saves the film. The movie is a first effort by Kinka Usher, who before did the Taco Bell commercial involving that dang dog. And his first movie is an amazing accomplishment, visually at least. Obviously Burton influenced him but I don't mind a Burton type rip-off as long as it's done well and this looks extremely good. But in the case of length, less is more. He has decided to go all out here. And while in the beginning it was a very bright and fresh movie (and I recall this past summer not being so great so I was welcoming this movie up to the 1 hour point), it does outlive it's welcome. 45 minutes more than it's welcome. But Universal has seen fit to give it a very nice DVD edition, and it's not even labeled under their more expensive Collector's Edition line. And it even has more things going for it than those titles do. The movie is presented in widescreen only, with a ratio of 1.85:1 on this single-sided, dual layered disc. It has been anamorphically enhanced for widescreen TVs. And the picture is surprisingly good, especially for an anamorphic down conversion. I couldn't find the jaggies I'm usually accustomed to. I saw no moiré effects. I didn't notice any other problems in the transfer of this film. The picture is pretty damn good. It's stays sharp throughout. Black levels never change and colours are always vibrant and bright, never giving of a chroma effect. If it weren't for one flaw, this movie could have come pretty dang close to a perfect grade. The problem is the print used shows a few flaws, which I found so surprising. The transfer was so good you'd expect they would at least clean up the few dots in the print. But they chose not to. So close, yet, so far! As well the movie gives a pretty impressive 5.1 Surround mix. Your sound system will get a good amount of use here. Next to all the channels are used throughout the whole film. And when called for that "extra channel" (as I call it) is given its share of work to do. The movie is loud and very clear. Dialogue is great almost all throughout. Of course, I realize that since I've started reviewing for this site I have done nothing (except for a couple) but mono mixes so I guess anything would sound good, I can tell this track is pretty damn good. But why didn't I give it a perfect score? Well, I noticed that near the end the music and effects became too much, taking away from dialogue. This is about the only real flaw I could find. Otherwise a very good mix. And finally, what do we get in supplements. Well, we get a very good amount. I'm actually quite surprised that this edition isn't labeled a Collector's Edition. I noticed it even was more worth my time than the Collector's Edition of American Pie. The biggest feature would be the commentary by director Kinka Usher. He seems to get the idea this movie is a classic and sometimes suggests the movie wasn't long enough. Obviously somebody must have forced him to cut it down because he sounded as though he wanted to keep this movie at 3 hours or something! Any longer would have been agony I think. He talks highly about the actors and mentions many times on how he used actors from the commercials and points them out to us. He even mentions some of the mistakes he made (like having to cut down Lena Olin's role). What I was surprised at was it was a fairly good commentary. I'm not big on commentaries, but it held my attention. There are a few dead spots but they don't last that long as he has a lot of info to share and covers it all pretty well. You get a "Spotlight on Location" segment, which I guess is an over glorified commercial but I found some useful things in here. It covers the cast fairly well, even getting Geoffrey Rush in there. We get comments on the director and get to listen to Kinnear moan about the costume he had to wear. It's not the most earth shattering behind-the-scenes look, but it's better than most I have seen. There are quite a few deleted scenes here. These are also not just crap scenes but they are all fairly good and funny. Some are expansions of other scenes (in those cases, they play the entire scene with the cut footage in its appropriate place) and we also get an alternate ending (they just destroy Casanova's scheme in a different way). The effects hadn't been edited in yet. But it actually only helped my appreciation for how actors must feel when they have to act pretending some effect is there in front of them. It's obvious why the scenes were cut, though. They would have made the movie a little more excruciating to sit through if they were still in there. I was disappointed that a lot of the cuts Usher mentioned in the commentary didn't appear, but I'm glad these were at least included. You get a soundtrack presentation, which is just a soundtrack commercial with a video. There are also music highlights where you get to jump to a certain song in the movie and hear a bit of it. In this case it also includes part of the scores. The production notes are your usual production note fair. There is also a set of notes on the history of the superheroes, which I did find interesting but it still was more on the making of the movie. What I would have liked, though, was to maybe see some of the artwork of the comic books, or maybe even a sample (I would find these on the DVD-ROM section, though). Cast and Crew biographies are also present, and they are your average set of biographies from Universal (meaning they are better than the Columbia/Tri-Star ones). A theatrical trailer is also present. DVD ROM features are also included. This is basically just the homepage on the disc. But it's still pretty good, unlike the rather sparse DVD-ROM bit on the American Pie disc. There are a lot of notes on here, which can be found on the regular part of the disc. But also in there are comic not too many people have DVD-ROMs). As well designs for costumes and sets can be found in there. Biographies yet again can be found. There is also a game included. It's actually just a puzzle. You get a bunch of puzzle pieces and you have to put them together to form the puzzle. It's nicely designed (pieces fitting in good) and is a nice time waster in the tradition of Solitaire and Tetris. Even though it is just the website on disc, it's a good extra, since the site is fairly good to begin with. In conclusion we have a fairly enjoyable movie that is better than most superhero adaptations. We get a very worthwhile disc from Universal (and pretty cheap, too!) with excellent picture and sound as well as a nice variety of supplements. Fans of the movie I can recommend this to. I can't see them disappointed. People who haven't seen it, rent it first. Official Site--A very well produced site with sections on the story, behind the scenes, comic book gallery, on location, postcards, screensavers, media, soundtrack, and game. 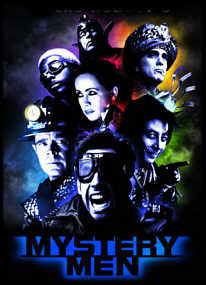 James Berardinelli's ReelViews--"Mystery Men isn't just clever - it's genuinely funny, as well." Roger Ebert--"Mystery Men has moments of brilliance waving their arms to attract attention in a sea of dreck." The World of Bob Burden--The official site of the creator of the comic book series. Amazon.com--Available to purchase are the DVD at special discount, the Flaming Carrot Comics: Man of Mystery by Bob Burden, and the original music soundtrack featuring various artists.